Strongyloides stercoralis has a relatively complex life cycle. Eggs released by adult females inhabiting the intestinal tract hatch, and the rhabditiform larvae is released and passed in the stool. The diagnostic form in humans is the rhabditiform larvae (approximately 380 µm long and 20 µm wide). This image is from an iodine stained wet-mount (200x). The rhabditiform larvae develop into the infective filariform larvae in the soil. 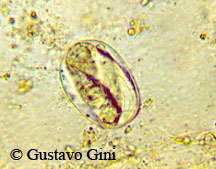 The ova produced by S. stercoralis in the intestinal tract hatch in the mucosa releasing the rhabditiform larvae. 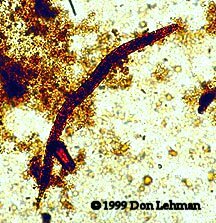 Ova (55 x 32 µm) are rarely seen in stool specimens and resemble hookworm ova. The existence of parasitic males is questioned. Females are thought to produce ova parthenogenetically.